And it's big (and hilly) enough that it's hard to hit even just the major rides in one day. So you really want to maximize your time and money on your visit. Don't worry: I've done the work for you. Follow these tips to help you get the most out of your visit. ...Especially if you're coming some distance. Unless you've managed to secure special discounts (click here to learn how to get discount tickets) your best deals will be found online at the Busch Gardens website. Plus, buying your tickets ahead of time saves you from those long summer ticket lines at the gate...so you can get to your favorite rides that much faster. 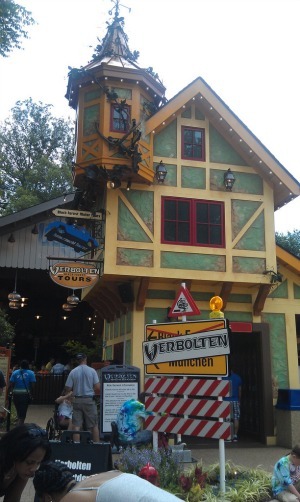 Don't miss Busch Gardens Europe's latest ride: Verbolten. If you're visiting in March, April, May, September, or October, be aware that Busch Gardens Europe isn't open everyday during those months. It's only open daily June-August. Plus, park closing hours can vary from day to day. So once you pick your date, double check our Hours and Operating Schedule page. 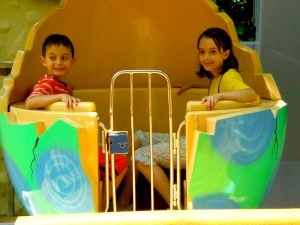 Going to Busch Gardens Europe during summer break? Try to go on a Monday or Tuesday. It's usually less crowded then. Avoid the weekends. If you have to go on a weekend, Sundays are less crowded than Saturdays. Fridays would be your second choice if you have to go on a weekend. 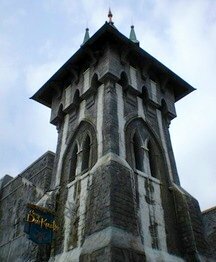 The Curse of DarKastle ride at Busch Gardens Europe. Save time and maximize the number of rides by purchasing a Busch Gardens Europe Quick Queue Pass. They're not cheap--ranging from $20 for the basic version to $50 for the VIP version-- but you'll be able to cut in line! To the coasters...pronto! Want to get on the newest Busch Gardens Europe roller coasters without waiting in horrendous lines? First thing in the morning and late night is best. The most popular coasters (after Verbolten and MachTower, in the Germany section) are Griffon, Alpengeist, Apollo's Chariot, and the Loch Ness Monster... so hit them early in the day if possible. Busch Gardens Europe is rather hilly, so wear good, worn-in walking shoes. Also, take advantage of the sky ride and train station. 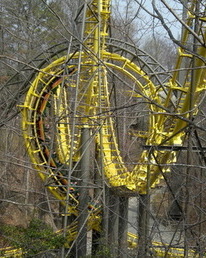 The train goes all the way around the park. You can take the full ride around the park (which takes about 20-30 minutes), or take it for just one or two of the three total stops. There are stations in Scotland, Italy (near Roman Rapids and Apollo's Chariot), and New France (near Griffon and the Le Scoot Log Flume). Keep in mind you may have to wait up to 20 minutes for the train (even if there isn't a line). In contrast, the Sky Ride cars run continuously, but since they only seat up to four people, you may end up waiting about the same length of time as for the train on busy days. The Sky Ride goes in a triangle, running from Germany to England to France. We went on a really quiet day in March and had 15 minutes to get from Land of the Dragons in Germany to England's Globe Theater for the London Rocks show. We took the sky ride (no waiting) and were at the Globe lickity-split. We would have to allow a lot more time in summer to cover the same distance. If you have someone in your party who's a bit afraid of heights, they may want to skip the Sky Ride. It really doesn't go that high, but someone like that might find having the Griffon and Loch Ness Monster coasters zoom by a little unnerving. For the rest of us, it's a thrilling way to see the coasters (and take photos) without actually going on the rides. You may be able rent one, but they charge around $16 for a single stroller. (And wouldn't you rather use that $16 elsewhere?) If you didn't bring your stroller and you could use a new one, it may make more sense to buy a stroller at Busch Gardens Europe. Ditto for wheelchair rentals, which are $15 for manual wheel chairs, and $45 for electric wheelchairs. During the busy summer season you'll probably have to wait in line for these, so plan ahead and you'll get to the rides that much sooner. The Sky Ride at Busch Gardens Europe has amazing views. Most people on a Busch Gardens Europe family vacation getaway find that the crowds head immediately toward Italy, so try going in the opposite direction toward Ireland and France. In the height of summer, it can get pretty hot at Busch Gardens Europe. The line outside DarKastle sprays a mist. Celtic Fyre is air-conditioned, and you'll spend most if not all of the wait in its cool, cave-like halls. Other cool spots include the Globe Theater (currently showing Elmo Rocks) and the Abbey Stone theater. The "Celtic Fyre" show gives you a break from the sun, so on hot days it fills up fast. Get there 30 minutes before the show for the best seats. Other cool spots are indoor restaurants like Das Festhaus, and of course, the shops. The observation bridge near Escape from Pompeii is a great place to cool down. If it's really hot, avoid Trapper's Smokehouse Restaurant; the food is fantastic, but you have to eat outside and the flies may enjoy it more than you do! Plus there is only limited shade there (although it's really fun to eat while watching Griffon zoom in the distance). You'll be better off inside in the cool at Das Festhaus. Other spots to avoid at Busch Gardens Europe when it's really hot: waiting in line for the Royal Palace Theater, Pet Shenanigans (except on the far sides and the back right under the trees), and Jack Hanna's Wild Reserve (they're all without shade). Rides at Busch Gardens Europe for really hot days (read: you need to get wet) include: Griffon, Roman Rapids, and Escape from Pompeii (get really wet on these two), and Le Scoot Log Flume (get less wet on this). 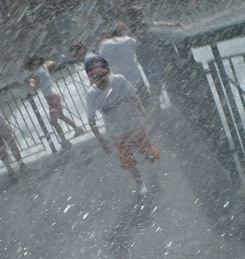 You can also get really soaked if you stand on the observation decks for Griffon and Escape from Pompeii. 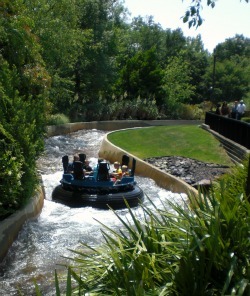 Busch Gardens Williamsburg's Roman Rapids ride is a great way to cool off. Kids can get ABSOLUTELY soaked in the water area at Land of the Dragons in Germany. It's a small area, but has water jets that burst from "volcanoes" and up through stepping stones. Our son got so wet on this that when we went over to the Pet Shenanigans show I kept cool by hugging him in his wet clothes! Hint: make sure your kids take their shoes off before going in the play area. Also, there's a fair amount of benches and shaded places for parents to set while the kids frolic in the water. Be prepared on your Busch Gardens Europe family vacation getaway. Bring a hat, use sunscreen (and insect repellent) and consider getting one of those cooling neckties or bands. They're filled with little polymer granules that soak up the water (you soak them before wearing) and then keep you cool for hours. See "Staying cool" for other ways to cool off. TIP! Get a Busch Gardens Europe free season pass holder! One of the perks of season passes (except for the Fun Cards) is that you can use them to get discounts throughout the park. 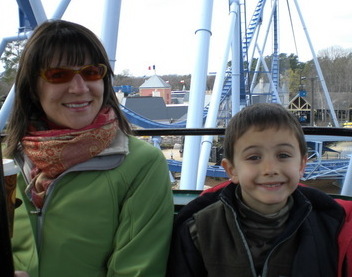 For example, you can get 10% discounts at Busch Gardens Williamsburg restaurants and shops. But you don't want to have to keep pulling your Busch Gardens Europe card in and out of your wallet (that's a great way to lose it!). So stop at the Guest Relations building (on your right, just after you go through the turnstiles at the entrance). Ask for a pass holder and they'll give you as many as you need. The pass holders are plastic sleeves (yes, they'll keep your pass dry on Griffon and Escape from Pompeii) which are clipped to a lanyard you hang around your neck. So whenever you buy something, just flash your card! Land of the Dragons has a wonderful water jet playground where kids can get happily soaked. Picnic areas are located in each parking lot. Picnics and coolers may not be taken in Busch Gardens Europe (except for baby food and medicine, which are permitted, just not in glass containers). However, I've always gone in with water bottles (small, half-size ones) and granola bars in down deep in my backpack. They check my backpack at the entrance and say nothing, So light snacks and bottled water should be fine. Just don't try to bring in a whopping cooler! Pet care is provided in the England Parking Lot (pets are not allowed in the park). Boarding is $20 for regular guests per pet, per day, and $18 per pet, per day, for season passholders. 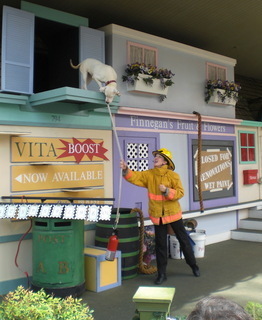 Busch Gardens Williamsburg's Pet Shenanigan's show is fun for the whole family. Be aware that the facility is ventilated but it's not temperature controlled (and it can get hot!). Pets will be offered fresh water but it is the owner's responsibility to bring food and feed their pet. Trained service animals (e.g., seeing eye dogs) are welcome throughout the park. The Busch Gardens Europe shows we've heard recommended over and over again-- and which we love-- Pet Shenanigans and Celtic Fyre in Ireland, as well as "Elmo Rocks" in the Globe Theatre. Our kids loved Pet Shenanigans. It's about 20 minutes, and full of too many cute animals to count. The only downside to Pet Shenanigans is that the theater is open air. It can get pretty steamy on a hot day, so go for the morning show. Or, do what we did: have the kids play in the water park in Land of the Dragons. They'll get soaked and stay cool throughout the show (you can stay cool too, just by hugging your wet kid!). Or, stop by the observation deck for Griffon and get wet there. 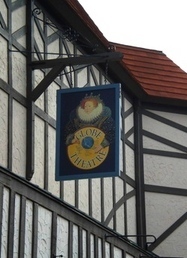 The Globe Theatre shows "Elmo Rocks" and "London Rocks." Anyway, Pet Shenanigans features dogs, cats, ducks, pigs, a rat, doves, and a parrot, all performing on cue in a very entertaining performance. The highlights: the terrier pulling up a fire extinguisher, a rat that outwits a cat, and a parrot that does math problems! We can also recommend the "Elmo Rocks" show if you have little ones. It's a 20-minute show with Elmo and friends and is amusing (for kids and moms and dads who want to rest their poor feet), clean, and we all enjoyed it. One tip: if you eat where there are outdoor shows, you'll get two types of entertainment at once. One place you can do this is the "Mix it Up" show at the Teatro Di San Marco in Italy. So go out and have a great visit!